that we were expanding our Lenoir, N.C. data center, our electricity provider Duke Energy committed to developing a new program to enable companies to buy renewable energy directly from the utility. At the time we also published a white paper explaining why we think this is important. Since then, we and others have been providing input on the development of a pilot program, which will officially be called the Green Source Rider. We’re pleased to report that Duke just filed their proposal for the Rider with the North Carolina Public Utilities Commission (NCUC) for approval. While the Rider still needs to be vetted by stakeholders and approved by the NCUC, we applaud Duke for developing a new option for customers to green their power supplies in North Carolina. Our long-term goal is to power our data centers with 100% renewable energy, and we look forward to working with Duke and others to find cost-effective renewable energy options that can be offered under the Green Source Rider. It’s our hope that this effort will encourage additional development of clean energy in North Carolina and elsewhere for growing companies like Google. Back in April, as part of an announcement that we were expanding our Lenoir, N.C. data center, our electricity provider Duke Energy committed to developing a new program to enable companies to buy renewable energy directly from the utility. At the time we also published a white paper explaining why we think this is important. You’d think the thrill might wear off this whole renewable energy investing thing after a while. Nope—we’re still as into it as ever, which is why we’re so pleased to announce our 14th investment: We’re partnering with global investment firm KKR to invest in six utility-scale solar facilities in California and Arizona. Developed by leading solar developer Recurrent Energy, the projects have a combined capacity of 106MW and will generate enough electricity to power over 17,000 U.S. homes. Google will make an approximately $80 million investment into these facilities. 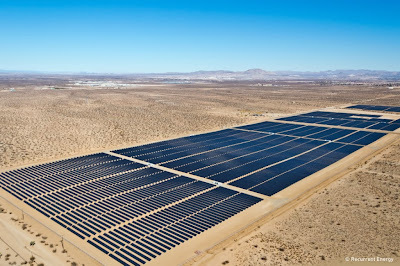 The 17.5 MWac/22 MWp Victor Phelan project (pictured), located in San Bernardino, Calif., is part of six Recurrent Energy developed projects acquired by Google and KKR. The six-project portfolio is expected to operational by early 2014 and will generate enough clean electricity to power more than 17,000 U.S. homes. This investment is similar to one we made back in 2011, when we teamed up with KKR and invested $94 million in four solar facilities developed by Recurrent. Those facilities have since started generating electricity, and we’ve committed hundreds of millions more—more than $1 billion in total—to renewable energy projects around the world. These investments are all part of our drive toward a clean energy future—where renewable energy is abundant, accessible and affordable. By continuing to invest in renewable energy projects, purchasing clean energy for our operations and working with our utility partners to create new options for ourselves and for other companies interest in buying renewable energy, we’re working hard to make that future a reality.